So, yeah, the Super Bowl and I go way back. I’ve attended six Super Bowls, and produced hours of content on the game, including blocks of NBC’s pregame show last year, and what stands out to me about the contest itself is that while the faces change, the emotion stays the same: Jumpy at the start, humbled at the finish. I’ve seen tears before and after, team-wide exhaustion and a stunning quiet in a locker room, and Charles Woodson’s broken collarbone. I’ve seen Peyton Manning throw warm-up passes so hard I thought he was going to break an equipment manager’s hands. I’ve seen Devin Hester return an opening kickoff for a TD and I could feel my vocal chords but not hear my screams above the din. I’ve seen a backup WR make a catch with his helmet right in front of me. I’ve watched Santonio Holmes float like a butterfly. I’ve marveled at the box of lightning that is Aaron Rodgers’ throws. I’ve walked through the confetti. And still, what stands out: jumpy at the start, humbled at the finish. At some point early for the players, the Super Bowl stops being a spectacle, and becomes the game that they’ve always known. Until that point, anything can happen, especially in a contest of wills and moves and countermoves between ostensibly the two best teams in the NFL. So, while looking for the little edges here and there to make a final score prediction, I had to factor in this jumpiness factor. These Patriots, Dynasty Vol. 2, are playing in their fourth Super Bowl over the past five years, and third in a row. It’s a working theory, I know, but they should settle down quicker. The Rams are turbo-paced and precise, and succeed with a lot of pre-and-post snap movement on offense. They are innovators, and young, with a coach who is still in his mid-30s. So. Yes, there is a real chance for mental errors on both sides of the ball here for LA. Then again, the Rams could also explode for two early TDs too, with that youthful energy finally being unleashed on the biggest game of them all. So let’s keep digging. With teams that are so evenly matched, both on the analytics side and with eyeball scouting, the most minute weaknesses need to be exploited. And here are the weak spots for both teams before Super Bowl LIII kicks off: The Rams can get beat deep, Brandin Cooks is awful against press and man coverage, and Jared Goff becomes Jared Goof when under pressure, while the Patriots have a 41-year-old quarterback, cement has been poured into their linebacker’s cleats, they have no real established deep threat, and most of the country is against them. That’s it. If you followed pro football even a little this season, you could have predicted the New Orleans-LA-New England-Kansas City Final Four by November 1st, and this Super Bowl matchup is not a surprise either. The strengths of both are many, and to this point those weaknesses above have not been exposed. Not really. 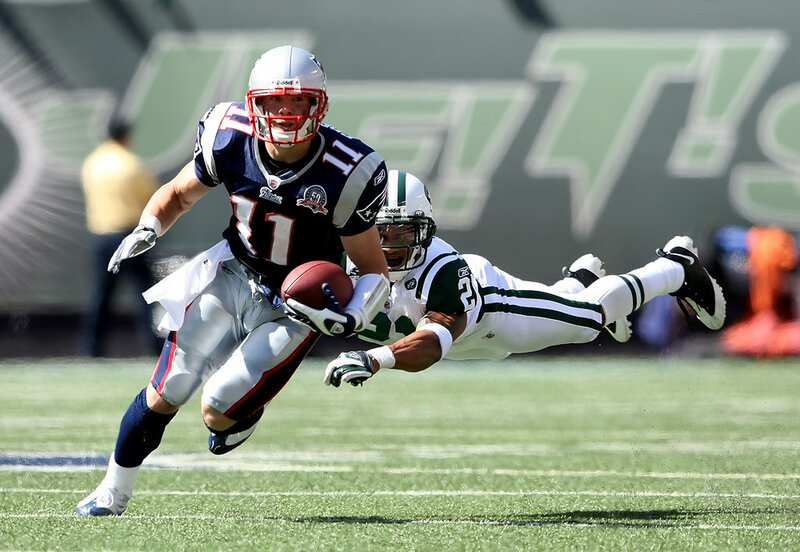 Edelman is one of two undrafted receivers who play a huge role in New England’s passing game. The Rams offensive line is the engine room for their dynamic offense, powering them to the No. 1 ranking in rushing success rate, and a No. 8 ranking in passing success rate. The Patriots O-line is just as dominant, especially in pass protection, allowing just the third fewest sacks this season (all of these stats are courtesy The Quant Edge). Both teams have an elite running back rotation, with the Rams boasting Todd Gurley and beer-bellied C.J. Anderson and the top-ranked rushing success rate (58%). The Pats have featured rookie Sony Michel, but are also famous for their misdirection, which means James White, the team’s dump-off back, and Rex Burkhead, a plow-horse, could become The Guy today. Even fullback James Develin could have a two-TD day. In the pass game, the Patriots have Julian Edelman and Rob Gronkowski, who have made catches in the grandest of Super Bowl moments, while the Rams have a terrific slot receiver in Robert Woods, and again, quickness everywhere. More general awesomeness: Both of their defenses rank in the top half in DVOA rankings, with ridiculous speed in their respective defensive backfields. -Rough up Cooks in bump. The former Patriot is the fastest player for either side, and so he must be erased. If you give him a zone defense to work against, Cooks will tear it apart. But against a rough customer like Stephon Gilmore in press-man, he could disappear. -Hound Goff constantly. Another stat from The Quant Edge: Under pressure, Goff falls way back into the pack with a 29thranked passer rating (58.2). The Patriots defense doesn’t have a showstopper like Richard Seymour or Tedy Bruschi or even Rob Ninkovich these days, but as a group they play well enough. While they won’t stuff Goff completely, Belichick wants the QB uncomfortable throughout, with his rushers’ hands up and arms outstretched, and maybe a missed assignment against that pressure turns into a killer INT. Aaron Donald may be the best player in the game today, regardless of position, at this point in time. -Send somebody long: The Saints gave the Patriots a template to beat the Rams with the passing game: Attack corner Marcus Peters deep (Michael Thomas had over 200 yards receiving against Peters during the regular season). While Julian Edelman will keep Nickell Robey-Coleman busy on the crossers, slants and comebacks, Cordarrelle Patterson and Phillip Dorsett need to beat Peters in single coverage straight down the field. Or at least establish the threat of going deep against him. The Rams, meanwhile, will attack the flat with Gurley, and look for mismatches on Woods. According to Pro Football Outsiders, the Patriots ranked just 22nd in the NFL against pass catching backs, and have been known to give up big games to No. 1 receivers. On the other side, defensive coordinator Wade Phillips needs the game plan of his career to attack that great Patriots line and pound on Tom Brady. It’s been done before, most notably in Super Bowl XLII, when Brady nearly tapped out due to the Giants pass rush from Michael Strahan, Osi Umenyiora, Justin Tuck, and Jay Alford. Wade’s dominant interior defensive linemen, Aaron Donald and Ndamukong Suh, better be in top shape, otherwise late in the game Brady will enjoy a comfy pocket which to work from. Cooper Kupp was halfway to an 80-catch season when he tore his ACL in Week 9. And I think he will have time to make those money throws in those final moments. All the little things that have been drilled into these Patriots, over and over since July, will be muscle memory at the finish here in February, and it’ll be just enough.